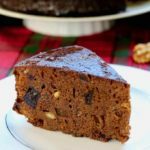 Of course, Christmas would still be Christmas without its traditional recipes, but it is so much more delicious with festive recipes like yule log, or bûche de Noël. 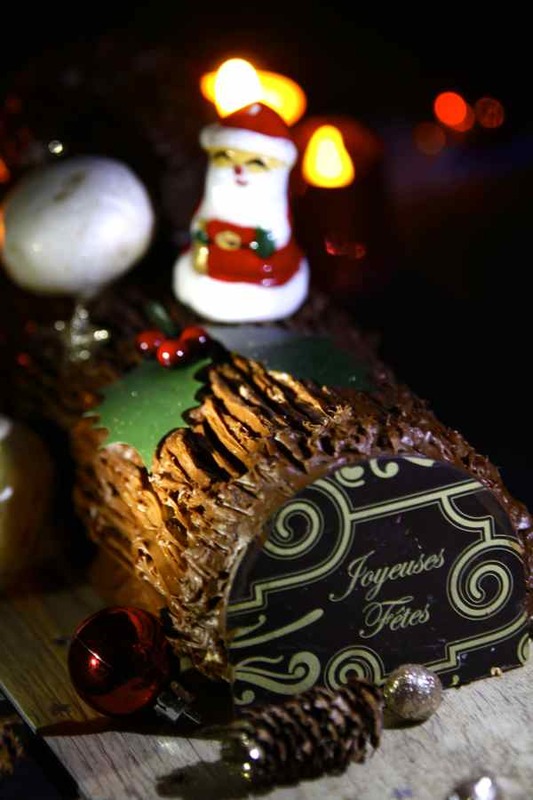 Although yule log is a typical French dessert, it can be found on most Christmas tables around the world. While Yule log is a traditional dessert served in many countries, whether in Europe or around the world, it is originally a French pastry. As its name suggests, this cake has the shape of a log ready to be thrown in the fireplace. It also has a rich history, full of symbols. 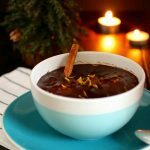 What is the origin of Yule log or bûche de Noël? 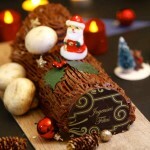 Because its history traces back to the Middle Ages, Yule log is considered part of France’s oldest culinary traditions. The day before Christmas, people used to go get a huge tree log, the Christmas log, and bring it home with pomp and circumstance, like a precious treasure. On Christmas Eve, the head of the household would place it in the hearth, and then conduct a ritual during which he sprinkled the trunk with oil, salt and mulled wine and recited traditional prayers. In some families, the oldest child would light the log. In others, the girls would do it, using embers from that of the previous year that were put aside to be used as a lucky charm in case of recent misfortune. It is said that the ashes of this log had the capacity to protect the house from both lightning and the evil powers of the devil. The choice of the wood species, the ignition practices and the burning time were all part of a special ritual that would vary depending on the region. After the huge log of wood had been cut off and taken home, masters, servants, parents, families, relatives and neighbors all gathered around a large bonfire. The log used during the fire ceremony was called Yule, licht or ceppo depending on the region. This event also celebrated at this time the arrival of the winter solstice. Indeed, as the solstice heralded the start of the very long and harsh winter, every household burned large slices of wood to keep the house warm. By the twelfth century, this practice was adopted by the Catholic Church. In order to give a Christian character to the ritual, the logs were sprinkled with holy water by the monks before being burned. The fire then had to be fed regularly, and had to burn continually from December 24th in the evening, until the Epiphany. This tradition disappeared after Napoleon prohibited the use of open fireplaces during the winter. It has long been replaced by the presence in the house of a small log of wood decorated with candles and greenery, and dug to contain treats. 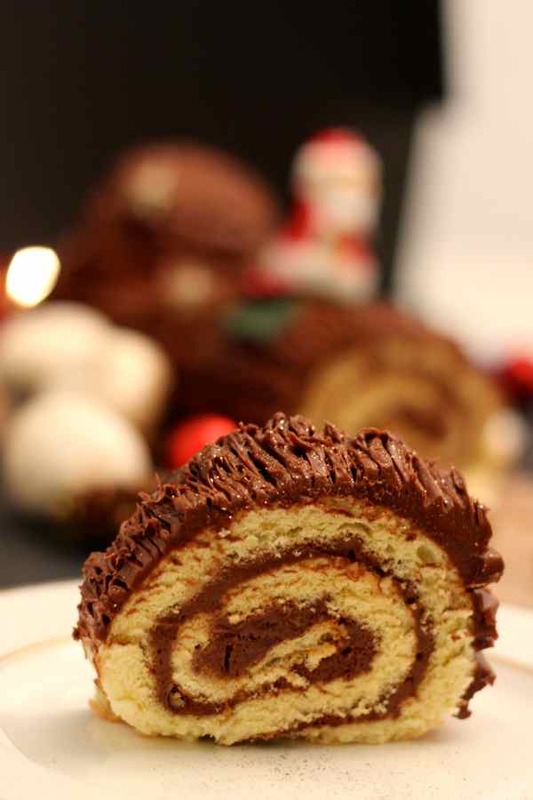 Today, the Yule log has become a traditional pastry, a delicious rolled cake topped with coffee or chocolate cream. 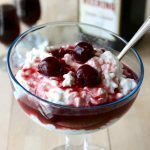 The question is, how did this dessert, which can be found everywhere in the world, mostly in French speaking countries such as France, Belgium, Quebec, New Brunswick, Vietnam, Lebanon, but also the United States, find its way to our tables? 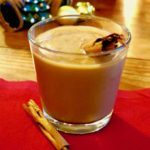 This dessert, which allowed people to keep celebrating the Christmas log ritual in a symbolic way, has a birth date that varies according to the sources. Some say it was created around 1834 by pastry workers at Hotel La Vieille France in Paris. Others think it was invented around 1945 by a pastry cook of Patisserie Colibri. 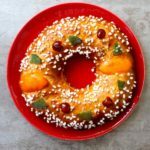 Others even link it to the traditional Christmas jelly roll recipe that was popular in the Poitou-Charentes region since the nineteenth century. This is how a beautiful piece of wood turned into a delicious rolled cake! It was my first Yule log ever. In all honesty, I am usually very critical of myself, especially when it comes to fine pastries. But I must confess that for a first time, I was very proud of my work! That day, I was with 3 friends. Marianne, Guy and Marc, who are all real epicureans and as such very tough judges, tasted it and they all loved it! Plan ahead and make this delicious chocolate Yule log for Christmas… or any other day of the year! 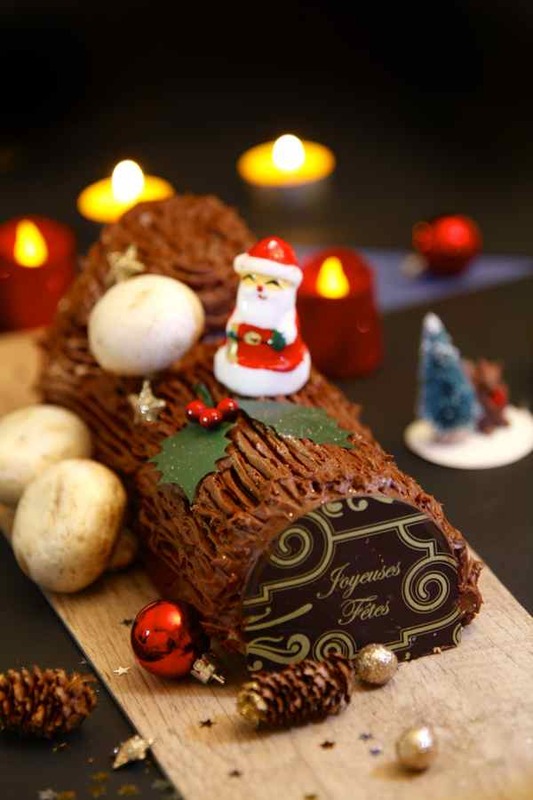 Yule log (Bûche de Noël) is the famous traditional Christmas dessert. 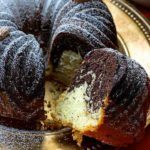 It consists of a rolled cake filled and topped with cream, traditionally chocolate. Separate egg yolks from white. In a bowl, whisk the yolks with 1/3 cup of caster sugar until they turn white and are firm. In a second bowl, whisk the egg whites with the remaining caster sugar until they are firm. Stir in sweetened yolks to white, lifting the preparation from the bottom of the bowl, very gently, in order not to break the whites. Stir in the flour very gradually, proceeding in the same way. Spread the batter in a rectangle baking sheet of about 12 x 16 inches covered with parchment paper. Bake for 5-6 minutes. Remove from oven and let cool. Turn the cake over on a second parchment paper and peel off the first paper from the cake. Melt chocolate in double boiler and set aside at room temperature. Beat the whole eggs and yolks with electric mixer for 4 minutes. In a non-stick saucepan, bring the sugar and water to a boil and cook over low to medium heat until reaching a temperature of 244 F. Soak quickly the bottom of the pan in cold water to stop the cooking. While whisking egg yolks, slowly pour the syrup to drizzle over the eggs and whisk briskly for several minutes until it is tempered. The mixture should at least double in volume and whiten. With the processor at medium speed, gradually and gently fold the butter. It is very important for the butter to be soft and not melted. Finish by gently incorporating the melted chocolate. Separate chocolate buttercream in two portions of ⅓ and ⅔. Combine water and sugar in a saucepan. Boil. Stir until sugar is completely dissolved. Cook over low heat for 3 minutes, stirring constantly. Reserve the syrup in a glass container and allow to cool until reaching a temperature of about 60 F. When cool, add liquor and/or selected flavor extracts. Spread evenly ⅓ of the chocolate buttercream on the entire surface of the cake. Roll the log lengthwise. Wrap tightly in plastic wrap so that it keeps its shape. Place in the refrigerator for 3 hours. Take the rolled cake out of the refrigerator. Cut one of the ends of the log. It will be used to make a "knot" (as in a real log). Using a spatula, spread the remaining ⅔ of the chocolate butter cream, then place the knot on top. Then coat the perimeter of the "knot" with cream. Using a pastry comb or fork, make streaks to imitate the bark of the wood. Optional: Add decorations at will, including mushroom meringues or candies. Please thank Chef Simon for this wonderful recipe! My husband has been buying ready made Yule Logs for the last 13 years and I can’t stand to even take a bite. Magnificence!